“From this we can conclude that all blue-eyed individuals are linked to the same ancestor,” said Eiberg. “They have all inherited the same switch at exactly the same spot in their DNA.” So if blue eyes are the result of a genetic mutation in a single individual, how did the trait spread from just one person to being present in 20 to 40 percent of the populations of some European countries today? One theory is that blue eyes were immediately considered an attractive feature, causing people to seek mates with blue eyes to have children with, enabling the genetic mutation to multiply. The finding of this rare mutation, probably dispersed in the rapid wave of colonization that followed the end of the last ice age, highlights one of the great mysteries of human evolution: the oddness of Europeans. Those from Europe and the Near-East have many characteristics that set them apart from the rest of the human race. 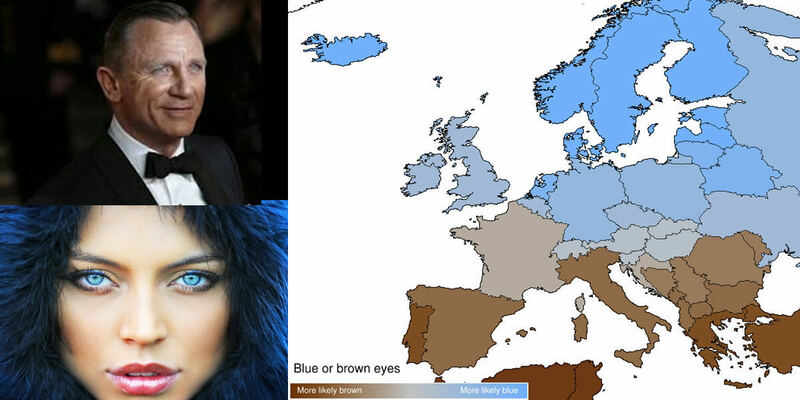 Not only are Europeans far more likely to have blue eyes (95 per cent in some Scandinavian countries), they also have a far greater range of skin tones and hair color than any other ethnic grouping. Natural lighter hair colors occur most often in Europe and less frequently in other areas. In Northern European populations, the occurrence of blond hair is very frequent. The hair color gene MC1R has at least seven variants in Europe giving the continent a wide range of hair and eye shades. Based on recent genetic research carried out at three Japanese universities, the date of the genetic mutation that resulted in blond hair in Europe has been isolated to about 11,000 years ago during the last ice age. A typical explanation found in the scientific literature for the evolution of light hair is related to the requirement for vitamin D synthesis and northern Europe’s seasonal less solar radiation. Lighter skin is due to a low concentration in pigmentation, thus allowing more sunlight to trigger the production of vitamin D. In this way, high frequencies of light hair in northern latitudes are a result of the light skin adaptation to lower levels of solar radiation, which reduces the prevalence of rickets caused by vitamin D deficiency. The darker pigmentation at higher latitudes in certain ethnic groups such as the Inuit is explained by a greater proportion of seafood in their diet and by the climate which the Eskimos live in, because in the polar climate there is more ice or snow on the ground, and this reflects the solar radiation on to the skin, making this environment lack the conditions for the person have blond, walnut or red hair, light skin and blue, gray or green eyes. This required condition in climates which have ice on the ground and places that are located in a region which has much or extreme amounts of solar radiation is commonly known as “escape the sun”. An alternative hypothesis was presented by Canadian anthropologist Peter Frost, who claims blond hair evolved very quickly in a specific area at the end of the last ice age by means of sexual selection. According to Frost, the appearance of blond hair and blue eyes in some northern European women made them stand out from their rivals at a time of fierce competition for scarce males.